Stella Campion designs and makes original pieces in precious metals. Stella uses techniques such as chasing and repousse on silverware to achieve unique results. Her work has received many awards notably the prestigious Goldsmiths’ Company 1st prize for her chased silver Pond Pot and also the John Downes Oppenheimer Artists award. Stella’s work is in many public and private collections, recently she has created the Pectoral cross for the new Bishop of Winchester, a silver altar cross for Oriel College Oxford, and altar candleholders for the University Church of St Mary the Virgin, Oxford. Stella works from her studio in Oxford. Stella is famous for her silverware such as chalices, cups and bowls formed by hand. She frequently uses the technique of chasing, using hammer and punches to create designs on precious metalware. Gilding and precious stones are also used, especially in ecclesiastical and presentation pieces. Stella will produce sketches and designs on paper so the client can visualise the finished piece. Stella Campion works with precious metals and stones. Stella trained as a graphic designer prior to becoming a gold and silversmith, and is skilled at producing designs on paper for her clients. She has extensive experience in design of gold, platinum and silver work, diamond mounting and stone setting. Uniquely Stella can realise your own ideas in metal, or create a design to suit your own personality. Stella specialises in wedding and engagement rings made to commission, in silver, gold or platinum. They can be made to your design or designed for you. She can use your own stones or remodel a family heirloom. 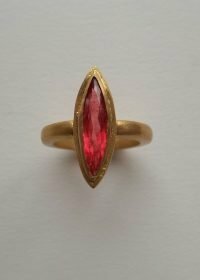 With a degree in graphic design Stella is skilled at presenting ideas on paper, realising your dream design or creating a ring unique to your personality. Any stones can be acquired on approbation so that the finished idea can be visualised prior to making up. You can also commission a bridal tiara, gifts for bridesmaids or family to complete your special day. This is very straightforward. Contact me and describe what you are looking for. Then visit my studio where I will show you images of past work, give you finished pieces to look at, and then make some preliminary sketches – all with no obligation. I will be able to give you a rough estimate of costs and timing. At the next visit we will discuss the design sketches and select which to develop. Should you wish I can then obtain a range of stones on Approbation to choose from. It is also possible to do all of this online if you prefer. At all times the process is simple, straight forward and enjoyable. Stella will require a deposit of 40% when the order is confirmed, with the balance payable on delivery .